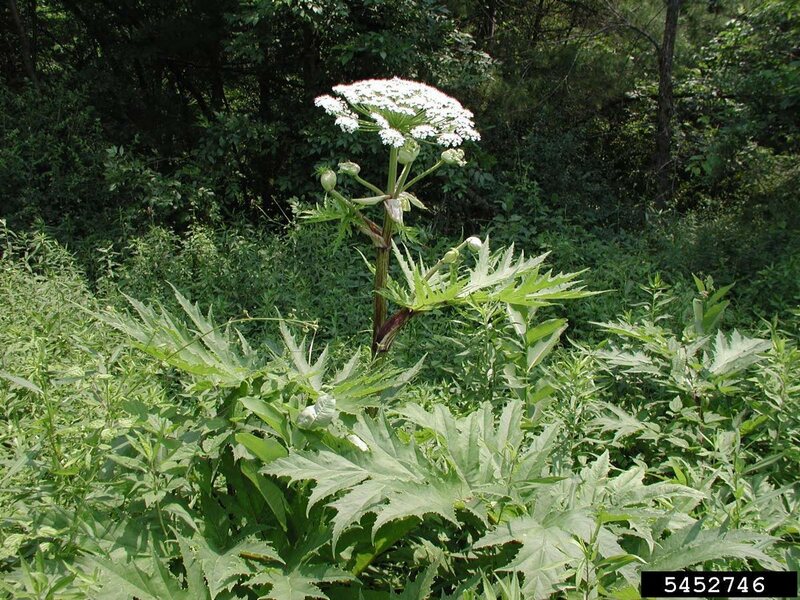 The giant hogweed (Heracleum mantegazzianum), is a member of the carrot family. An invasive plant is one that is non-native to the environment into which it has been introduced. Very often the introduction of such plants is due to the ever increasing trade and tourism. They often have the ability to thrive and spread aggressively outside the native range when introduced to a new habitat causing economic or environmental harm or harm to human health. Introduced plants may be successful in their new habitat because of their fast growth or aggressive root systems which may smother the roots of surrounding plants. Many invasive plants produce large quantities of seed which may be distributed over large areas by birds, wind or humans, knowingly or unknowingly for example on shoes or clothes. Some invasive plants adapt easily to new environmental conditions and others will tolerate a wide range of environmental conditions. They may have no natural enemies therefore they are able to spread far and fast displacing other plants and in this way disturb the ecosystem. In these ways an invasive plant species competes directly with native species for moisture, sunlight, nutrients and space. They therefore may contribute to the decline of native species which may become threatened. The spread of invasive species can degrade wildlife habitat and decrease overall plant diversity. It is a native of the Caucasus between the Black and Russian Seas. There it grows on forest edges and in clearings, often alongside streams and in wet mountain areas. It readily colonises bare and waste ground and on ground disturbed by man. It was taken to the UK and Europe by Victorian botanists as an ornamental in the 19th century and then to North America in the 20th century by plant lovers who were taken in by the amazing leaf structure. It is often mistaken for poison hemlock or Queen Ann’s lace due to the similar flower characteristics. In its adopted habitats it grows on river banks, alongside roads and on waste ground. Under ideal conditions the giant hogweed may grow to 5.5 metres (18 feet). The flower head is an umbrella shaped white cluster up to 80 centimetres (31 inches) across. A single plant may produce 20,000 seeds or more which are dispersed far and wide by wind or water. The life cycle of the plant is complex and takes place over a period of three to ten years after which the plant dies. Many of these seeds will give rise to healthy seedlings, growth is fast and vigorous hence a single seed is capable of founding a new population. This plant is also poisonous and if sap gets into the eyes may cause blindness. Third degree burns may also be caused with skin contact. 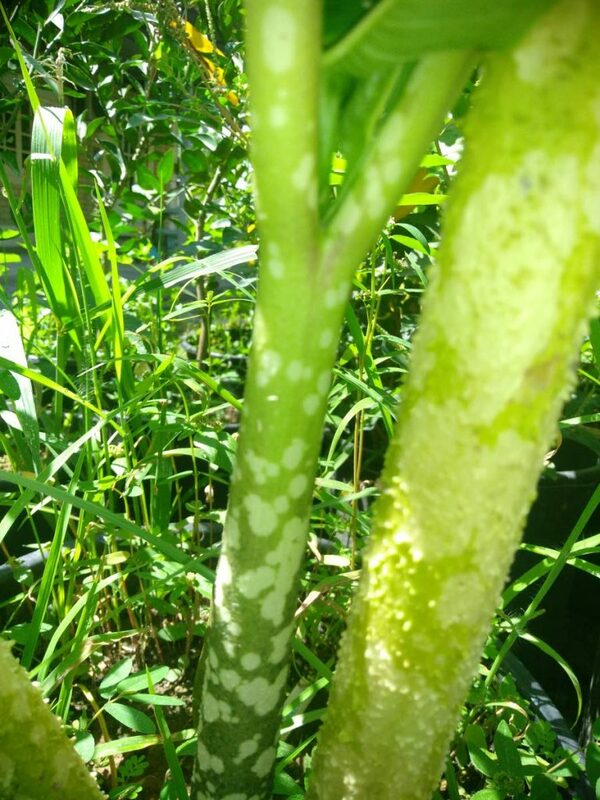 Even brushing against this plant can cause skin irritation and severe reactions. The sap is described as phototoxic meaning that the poison is activated by sunlight. The best first aid remedy is to wash the skin with soap and water and to rinse the eyes with plain water and to get out of the sun. Many countries now have programmes for eradicating it. Finally let us give a thought to what we can do to prevent invasive species becoming a problem. The best way to fight invasive species is to prevent them from occurring in the first place. You can help protect native plants and animals by verifying that the plants that you buy for your home or garden are not invasive. 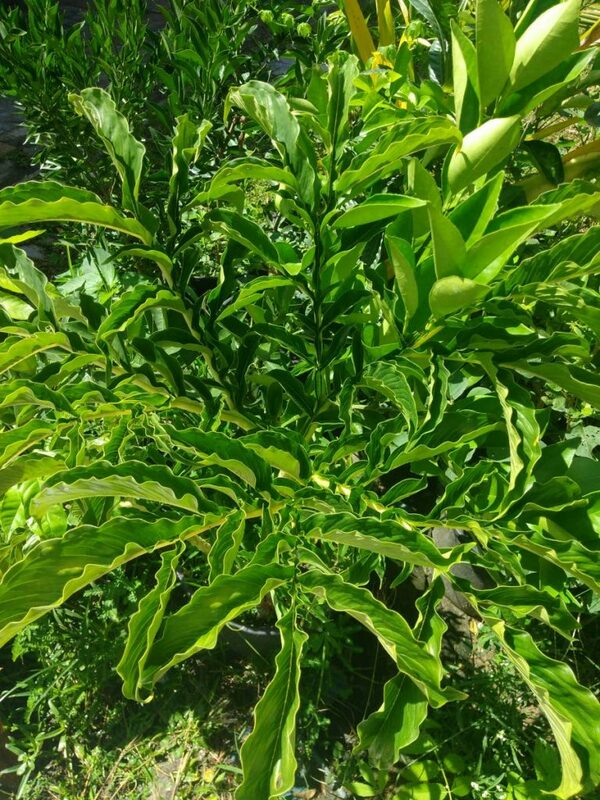 When you travel do not take plants that are native to Trinidad and Tobago with you to other countries and similarly do not import non-native species without going through plant quarantine. The Plant Quarantine Service protects Trinidad’s borders from the invasion of pests and diseases by inspection of cargo and baggage at ports of entry. Suspicious plants may be sent for testing before being either released back to the importer or destroyed. * For further information contact the Eastern Horticultural Club at 357-5033, 764-9125 or 720-2698 or easternhorticulturalclub@hotmail.com The club meets on the first Saturday of every month (except public holidays) at 3 pm at Moreton Hall, Aramalaya Presbyterian Church, Cochrane Street, Tunapuna. Reply to "The giant hogweed"